Andrew V. Logan – Logan Logan & Watson, L.C. Andrew joined Logan Logan & Watson in 2015 as an associate. Andrew assists clients in a wide range of firm practice areas, with a particular focus on client matters in business, real estate, estate planning, and public and administrative law. Prior to joining the firm, Andrew attended the University of Kansas School of Law where he earned a Business and Commercial Law Certificate. During his time in law school, Andrew was a Legal Extern for the Honorable John D. Tinder of the United States Court of Appeals for the Seventh Circuit. 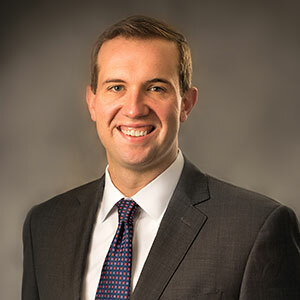 Andrew assisted Judge Tinder by preparing bench memos in federal civil, criminal, and agency cases and assisting in the drafting of appellate opinions. Andrew also has expertise in navigating federal legislative and regulatory affairs as a former legislative aide in the United States Senate. In his time as a Senate aide prior to entering law school, Andrew worked with local and national stakeholders and constituent groups on health care, education, and labor policy matters. Andrew also served as a senator’s staff liaison to the Senate Special Committee on Aging. Andrew and his wife call Prairie Village, Kansas, home.